Follow the link and get 15, 20, or 25 percent off your order, depending on how much you spend. To be clear, this isn't a an ad where I get something if you click through. I don't get any credit or glory if you click the link or if you buy from them. They haven't paid me anything or offered me anything or bribed me to pass this along. I like the company and its products, so I'm happy to pass along a deal. 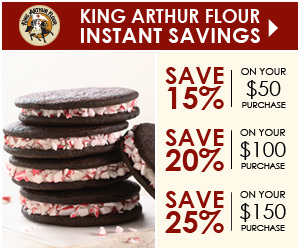 Being frugal myself, I usually look for deals like this before I spend big bucks stocking up and splurging, particularly before the holiday baking frenzy. So, what the heck. You've got the link, you can have the discount, use it if you want it. It's good until Friday.